On Tuesday, following the Army Corps of Engineers (USACE) decision not to grant Energy Transfer Partners (ETP) and Sunoco Logistics the easement necessary to bury the Dakota Access Pipeline (DAPL) under the Lake Oahe reservoir, Standing Rock Sioux Tribal Chairman Dave Archambault II released a statement saying the time had come for water protectors to leave the protest camps when roads are safe and return home. On Monday, the day after the USACE announcement, a blizzard moved through much of central North Dakota. 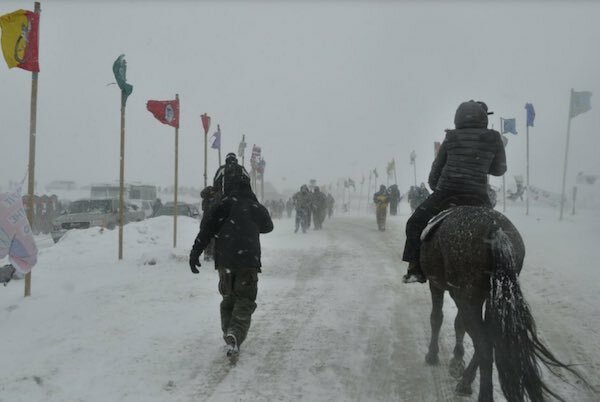 While many had been anticipating the arrival of freezing weather for months, scores of people who had travelled to Standing Rock to support the tribe over the weekend were caught unprepared by the storm and sought shelter on the reservation at the Prairie Knights Casino and Resort. The general manager of the casino, Everett Iron Eyes Jr., told local reporters 600 to 700 people spent Monday night there—many happy to sleep in hallways if it meant staying warm. Staying warm in North Dakota this time of year isn't easy. The projected high temperature in Cannonball, N.D., today (Dec. 8, 2016) is 2 degrees. The low is negative 14. The fate of the nearly-completed, $3.7 billion project is uncertain. Though the USACE decision suggests alternate routes be explored while a full environmental impact statement (EIS) is prepared, company executives were quick to reassure their investors they remain “fully committed” to finishing the pipeline. Fearing ETP will drill under the reservoir anyway and simply pay a fine after the fact, many water protectors and their supporters are skeptical of leaving. But Archambault maintains that the increasing risk of injury or death, due either to extreme cold or further confrontations with law enforcement, now jeopardizes all that has been accomplished. If the camp stays where it is currently located, people are risking their lives. The current weather is severe, making travel impossible. If the camp stays, we run a risk of further provocation from local law enforcement. Once one person is hurt or property is destroyed, that will lead to more outsized actions by law enforcement. The longer the camp stays, the greater risk we run of seeing further violence at the hands of law enforcement and potential injury to our supporters. Our great leaders of the past would never put the people at risk of harm, especially women and children. I don’t want anyone to be living in an unsafe environment. We need to stay in prayer, believe in our prayer, and begin our journey home in prayer. I believe in my prayers and in the Creator. Take the lessons we learned here and apply them at home—unity, peace, prayer. I know this is a victory for this one DAPL battle, but we have not yet won the DAPL war. There will be more battles ahead and we will continue to strategize and win. The camp has brought us this far—now it is time we pivot to the next phase of this struggle. That will be lead on different fronts like in court, with the new Administration, with Congress, and with the investors. We are establishing a path now to help the world understand that what we asked for and what we got is the right decision. The world is watching us and our behavior will determine the final outcome. I am asking each and every one of you to come up with a strategy to close and exit the camp. I respectfully ask that you leave the land as it was when you arrived, and return home before the winter grows more severe. Pass this on—let everyone know that we are thankful for their passion and commitment and we are thankful for them all standing with us. It’s time now to enjoy this winter with your families. We need all to respect the host tribe’s wishes. 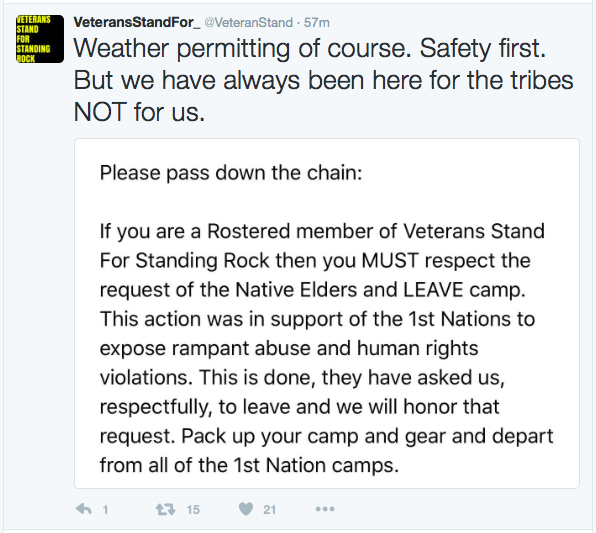 We are asking all tribes to pass this on to their members. This storm is a glimpse of what is to come as temperatures are still not reaching the winter lows of this region. I understand that folks cannot go at this moment, but as soon as this current storm has passed, we must execute an exit strategy and continue our battles to protect water. These efforts are not only needed in Standing Rock, but they are needed throughout Indian Country, across America and internationally. I want you to know that Standing Rock stands with you as you return home to carry this energy and movement into the future.